Here is another close-up study of the spring water flow on the Gooseberry River. 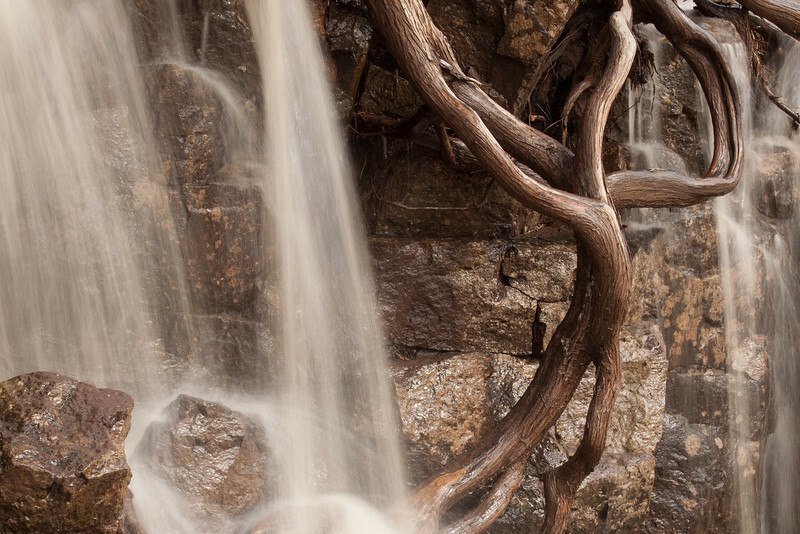 I was really intrigued by these tree roots near Lower Gooseberry Falls and thought they would make for an interesting photo along with the flowing water. The trick was in composing a nice shot of the scene, as it was a very "messy" scene with a lot of elements to try and make into a pleasing image. I messed around with both vertical and horizontal compositions. My initial thought was that vertical was going to work best but in the end my favorite was this horizontal shot. I hope you enjoy viewing it as much as I enjoyed making it! Well, as I sit here laid up for the third day in a row, I find myself wishing I was more mobile and able to be out in the woods appreciating a magnificent night sky. With that in mind, I went back to some photos from October 2013 to post a shot that conveys what is on my mind for today. This was during a very nice aurora outbreak that started at around 11:30 PM on October 1st and carried on until at least 4 AM on the 2nd. The picture shown here was made at 2:36 AM and is looking straight up at the sky. 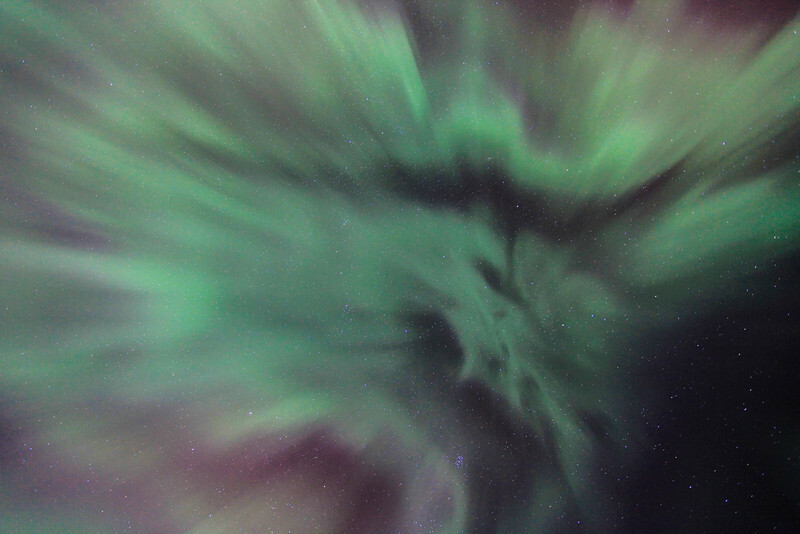 When I first viewed this image I immediately saw the shape of a bird within the lights of the aurora and it made me think of flying away from Earth towards the stars. It was an amazing scene to witness at the time and is equally amazing, I think, to view the images today. The Pigeon River is finally running freely after a VERY long winter. 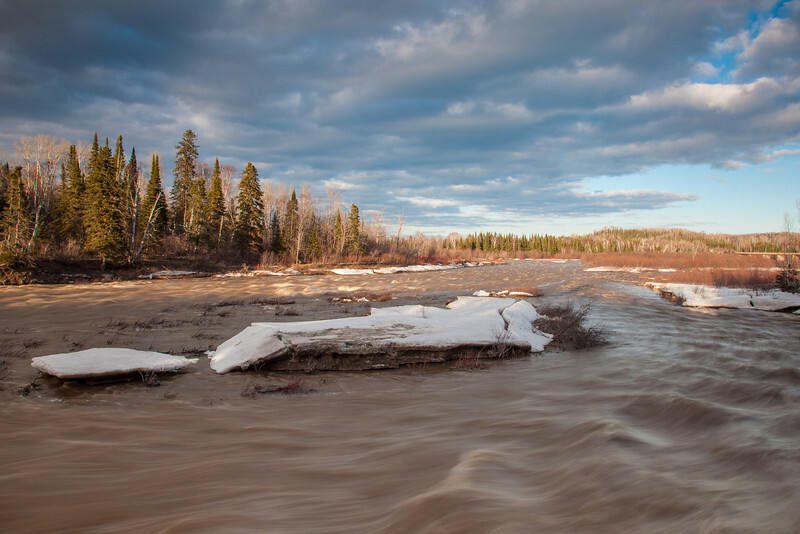 Right now the water height on the river is very high and should stay that way for a while as there is still a lot of snow yet to melt in the river's watershed. Here is an interesting capture that is the result of circumstance. I was photographing the high water level at High Falls of the Pigeon River and my camera was quickly getting to the point of being too wet thanks to the copious amounts of spray coming from the falls. 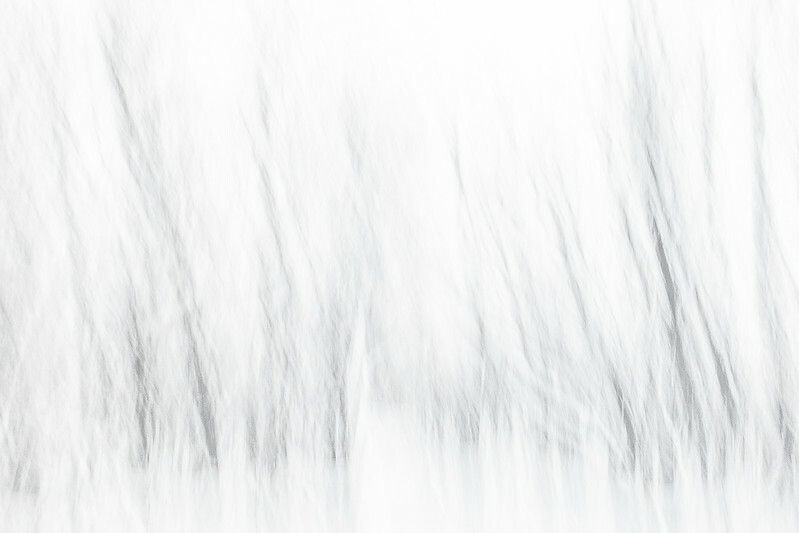 I retreated to the cover of some nearby trees along the High Falls boardwalk to take a moment to dry off my camera. I had left the camera in live view mode and when I set the tripod back down it just so happened that the camera was facing in the direction of the sun. When I lifted my cleaning cloth to wipe moisture from the camera I noticed that the water on the lens was creating this surreal effect to the image on my live view screen. 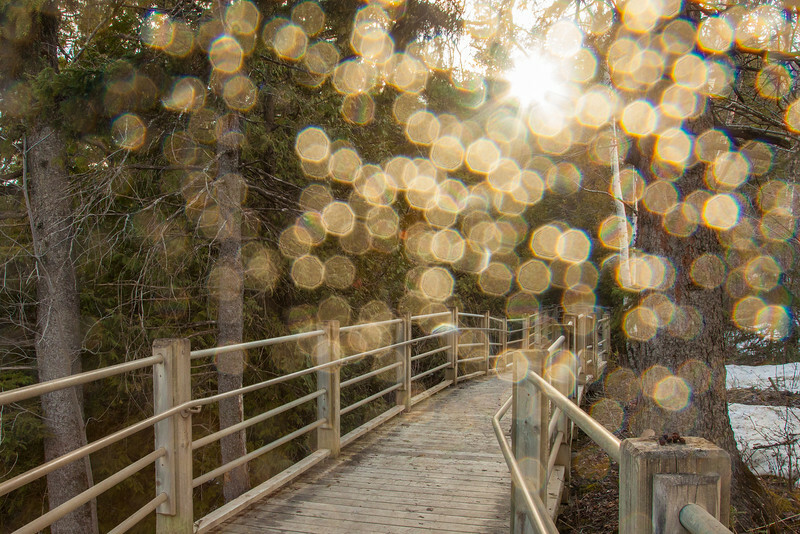 I thought it made for a rather intriguing "fantasy world" type of view with the boardwalk leading into the forest and these light flares from the water droplets on the lens. I think the photo has a very mystical feel to it and I felt I had to come up with a suitable title for the image. My title of choice became "The Path to Enlightenment". Here is a follow-up image to "The Path to Enlightenment", the image I posted this morning. You may have been wondering from that photo what lies at the end of that path. Well, here is the reward for walking that path. If you take that path in late afternoon on a sunny day you will be treated to one of the most amazing views I've ever seen in the Minnesota north woods. 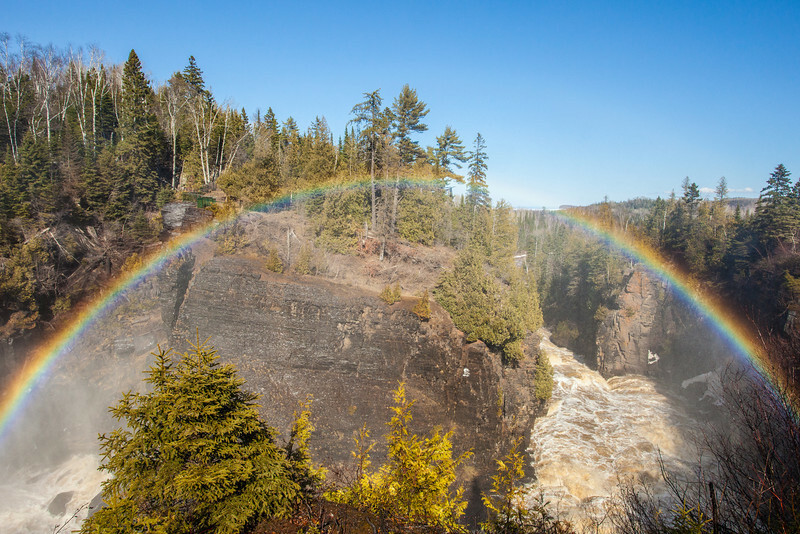 A full, end-to-end rainbow hovering over the gorge just below High Falls on the Pigeon River. What can I say, the title for this image was a no-brainer as that is exactly what I felt when I saw this beautiful rainbow! Yesterday I spent part of the day at Cascade River State Park with my camera. The goal was to shoot both stills and video of the many waterfalls along the river as it makes its final descent to Lake Superior. I ended up with a nice wildlife surprise which I will tell you about in a later post. For now, the focus is on the waterfall. My favorite waterfall image of the day is one that I made with my new Tamron 150-600 lens. This is the most photographed waterfall along the entire length of the Cascade River and it is the section from which the river derives its name. The tendency here is to get a wide angle shot that shows all of the cascading drops, but this time I chose to focus on individual sections of the cascades, using my telephoto lens to isolate smaller areas of the falls. This image was taken with the zoom set at 250mm. It certainly is a beautiful river to photograph and is at its prime right now in terms of water flow. Be sure to watch for my video (coming VERY soon!) from the day's adventures, I'm sure you'll like it! As promised in my last post, here is a photo from the cool wildlife encounter that I had yesterday at Cascade River State Park. 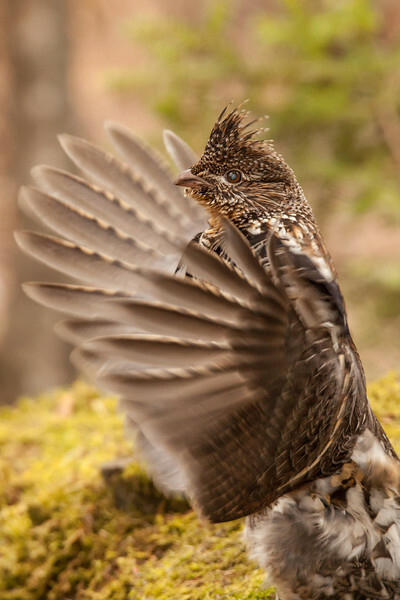 For the past several years there has been a Ruffed Grouse drumming on the same rock in the park campground. After photographing the waterfalls I figured I'd head over and see if he was there again this year. Sure enough, he was! "May Icebreaking Operations in Thunder Bay"
I made a trip up to Thunder Bay yesterday and this is what I saw going on out on the lake. 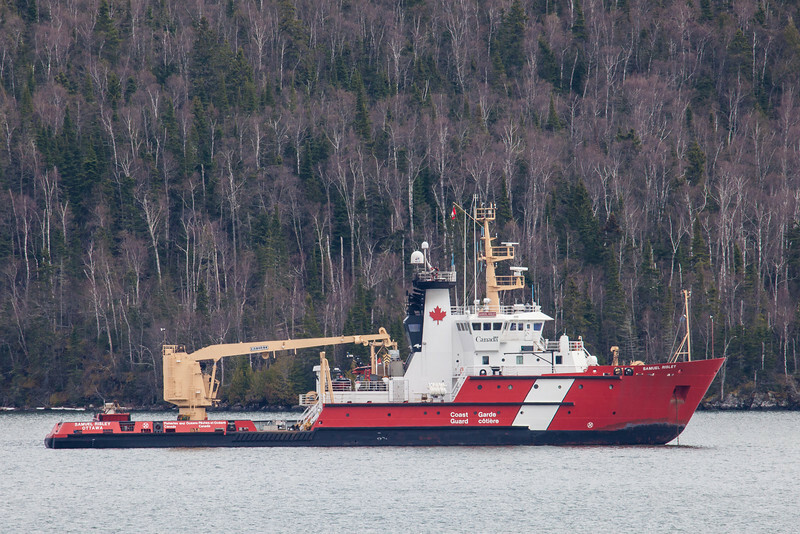 A Coast Guard icebreaker had just cleared a path through the ice to the open water near Pie Island and had turned around to head back into the bay. A freighter was following close behind. 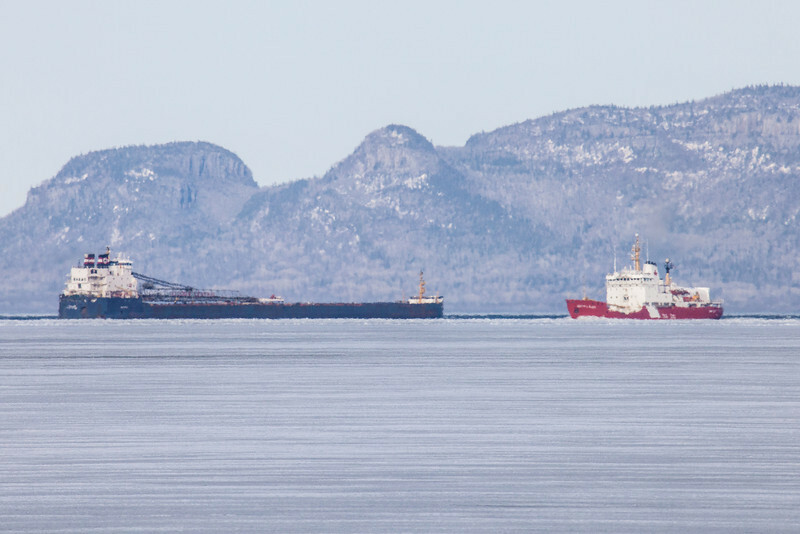 I captured this image from the shoreline of the Fort William First Nation as the icebreaker was heading back into the bay just before it passed by the freighter. The Sleeping Giant Peninsula is in the background, with the Head of the Giant on the left side of the photo. "Serene Spring Day on the Susie Islands"
After several cloudy days, we've got sunshine again! So far, this spring has felt more like fall with cool days and very cloudy skies. But, for today anyway, it's nice and sunny AND WARM! Starting again tomorrow, the forecast for the next 4 days calls for more clouds and rain. Go figure. Anyway, here is an image that celebrates the wonderful weather we are having today! This was taken from the Mt. Josephine highway wayside in Grand Portage. 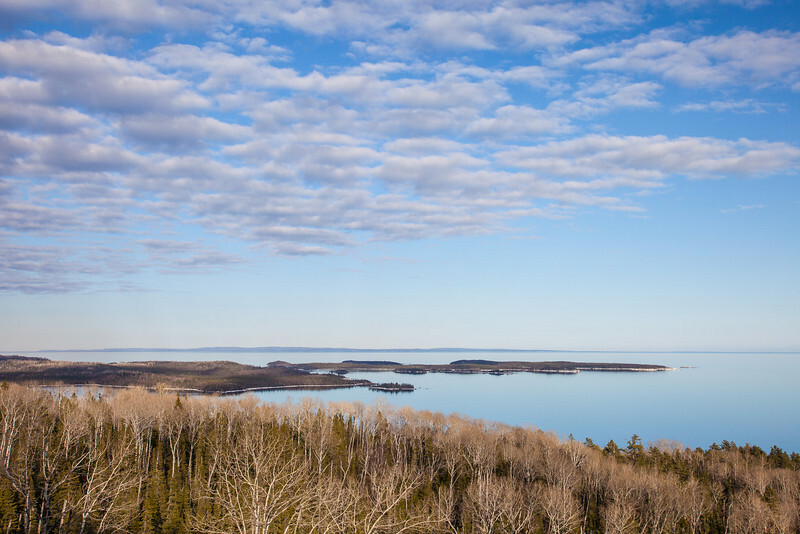 The view overlooks the Susie Islands in the foreground and Isle Royale National Park on the horizon. It is one of the coolest views on the Minnesota shoreline of Lake Superior and is one of my favorite places to make photographs. 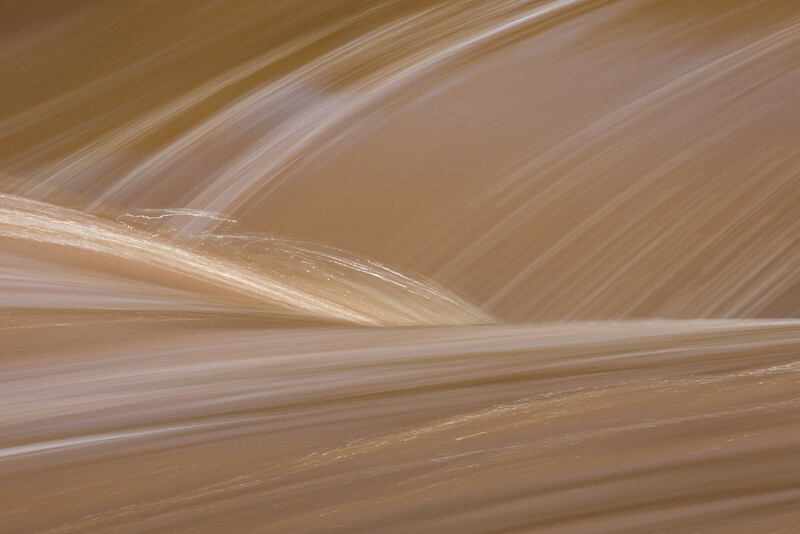 One of my favorite bits of moving water to photograph. The "standing wave" at the top edge of the rapids just upstream from Middle Falls on the Pigeon River. There is this beautiful, extremely photogenic standing wave that exists at the point where the water first drops down into the rapids. It always makes for an intriguing photograph, but especially so when the water level is high like it is now. 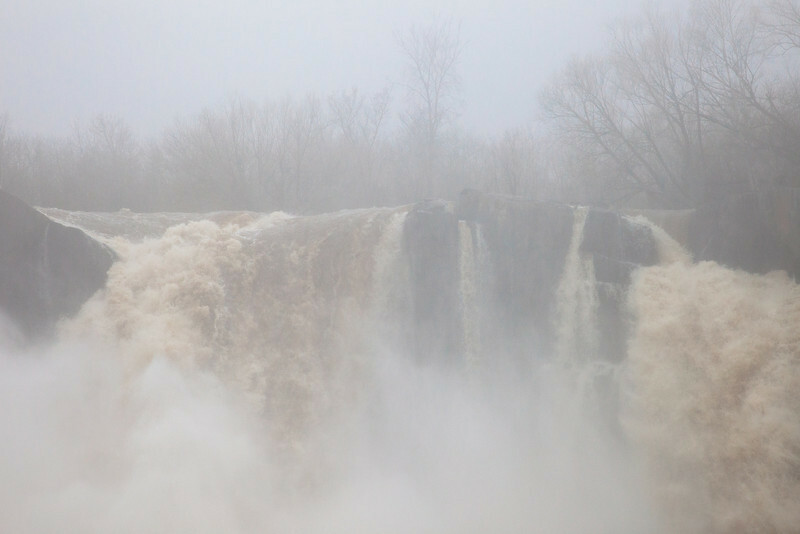 "Foggy Day at High Falls"
High Falls of the Pigeon River is putting on quite a show this year! The water level has been incredible for about the past two weeks now and continues to impress onlookers with each passing day. This photo was captured a couple of days ago when there was a very thick fog blanketing the landscape. 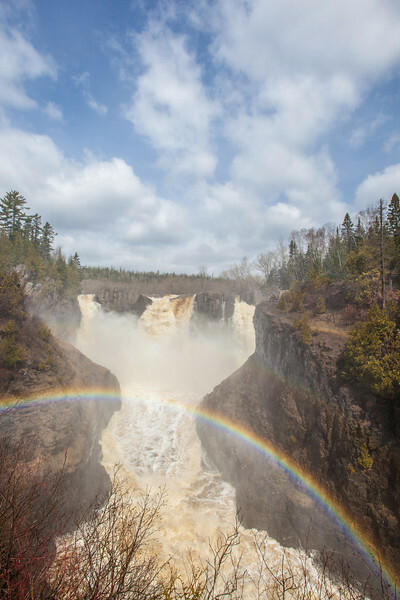 The scene that day at High Falls was one of mysterious, mystical beauty. 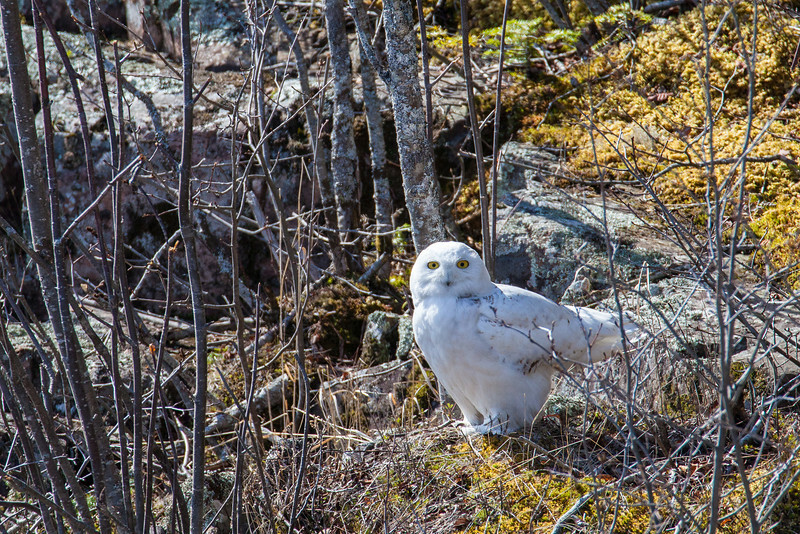 Yesterday we saw something that we had hoped to see all winter but never did... a Snowy Owl! We got a call from my dad in the morning saying that there was a snowy owl sitting on the rocks on the Lake Superior shoreline right out in front of his house. We headed over there as quick as we could, realizing that he would probably be gone already but hoping that he might still be there. Well, we were lucky and he was still there! It's pretty unusual to see one of these owls even in the winter (the most likely time to see them), but especially unusual this close to summer. We watched him from the patio doors of my parents house for about 5 minutes, then he flew off around the point and down the shore. It sure was a terrific start to our day! "Samuel Risley in Cloud Bay"
The other day we made a quick trip up to Thunder Bay to pick up a cake (Carol's Cakes.... mmmmmm yummy!) for my grandma's birthday. On the way home we decided to take a short sightseeing detour down to Cloud Bay. Imagine our surprise when we rounded the corner about to drop down into the bay and there sat the Samuel Risley, big and bold in the bay! The Samuel Risley is a Canadian Coast Guard icebreaker and buoy tender. I just love the Canadian Coast Guard vessels. I think their red and white colors make them beautiful boats. And, to me, the Samuel Risley has one of the coolest designs of any Coast Guard boat I've seen. I'm not sure what they were doing in the bay (the boat was anchored), but it sure was cool to get such a great view of it! 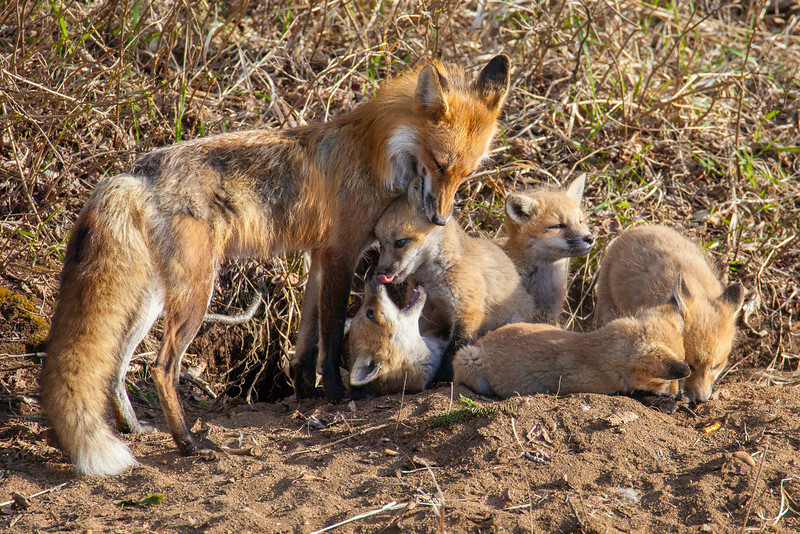 "Fox Family with 5 Kits!" This morning we got up bright and early to make the 40 minute drive to a fox den in time to catch the morning light. Then we waited almost an hour for the family to make its appearance. We were just starting to wonder if they were even still in the den when Jessica spotted one of the adults coming out of the woods. 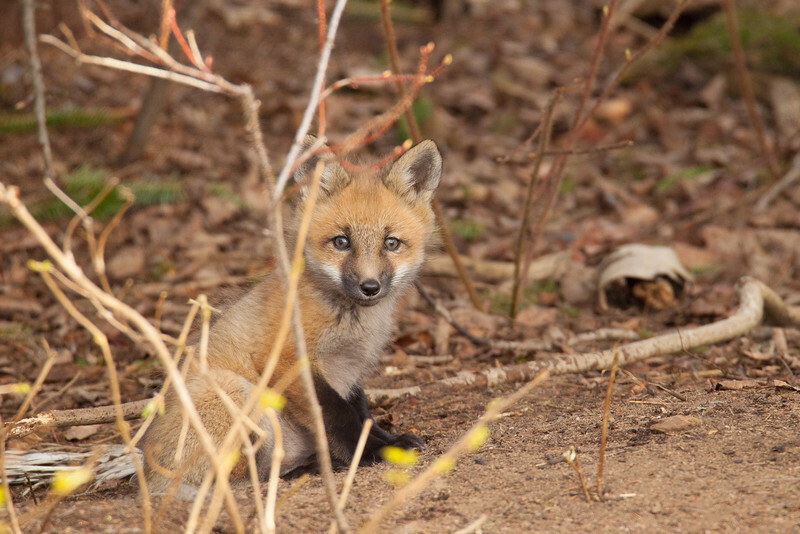 The adult went to the entrance of the den and started making noises, calling the kits to come outside. Just seconds later we saw one little fox head pop up out of the den, then another, then another until finally there were 5 of them out in the open! All 6 of them (the five kits and the parent) sat right at the entrance to the den for a minute or two, then the adult went off into the woods. For the next half hour to 45 minutes we watched the five kits run around and play, then it was time to head back. It sure was a fun start to our Saturday! 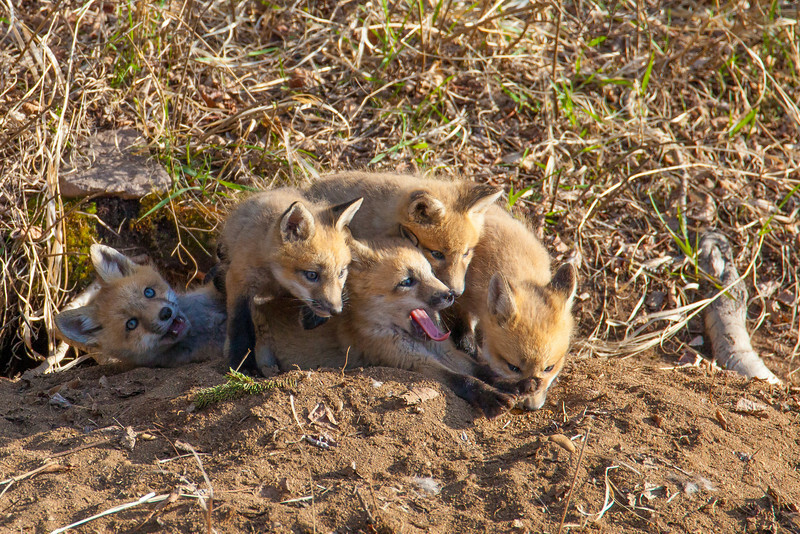 Here is a shot of the five fox kits just moments after the adult went back into the woods. The adult had just called them out from the den for the first time that day and the kits appeared sleepy and reluctant to run around at first. For a minute or two they just hung out at the entrance to the den in a pile like you see here. After several yawns they started to run around and chase each other. They sure were cute! 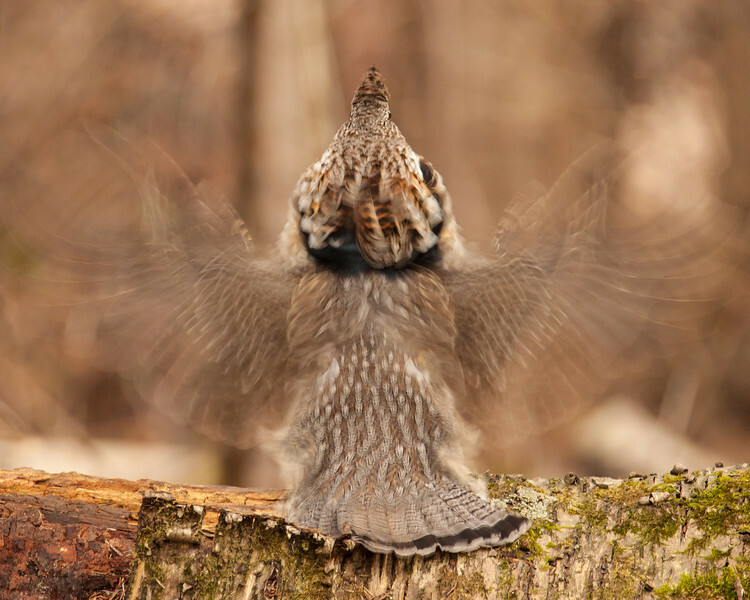 The other day I had another awesome opportunity to photograph a drumming ruffed grouse. He is located in a very nice wooded setting with several shooting angles on his drumming log. My favorite angles were from the side and the back. I saw him in the evening so the light was not plentiful but I still managed to get some shots with a decent shutter speed. The light may not have been plentiful but it sure was beautiful light. The grouse drummed frequently, about once every minute while I was there. This allowed me to get several shots from several angles as well as a very nice collection of video clips from various angles. I suppose all young ones are curious, no matter what the species. 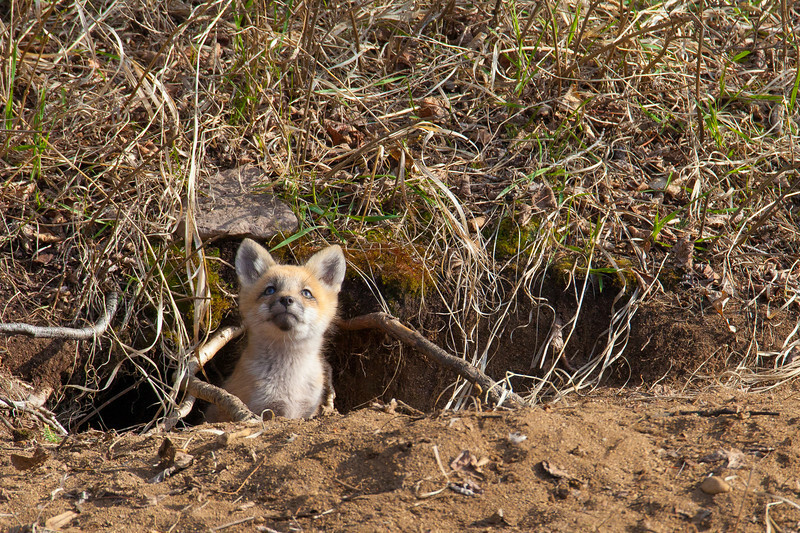 I know these fox kits sure are curious! It's fun to watch them explore the area around their den. They are very playful but also very inquisitive, sniffing and turning over every rock and stick they can find. And, whenever a raven flew by overhead they were all eyes on the sky, watching the bird. 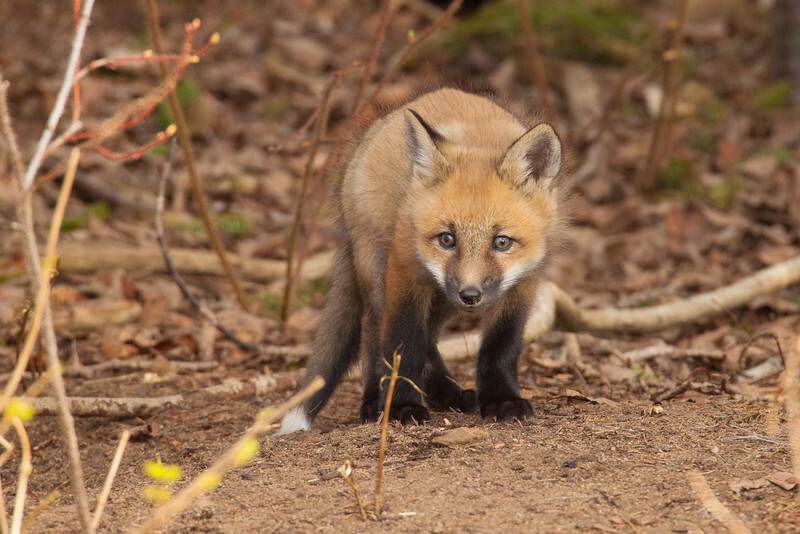 Here are a few images that I think show the curious nature of these young fox. 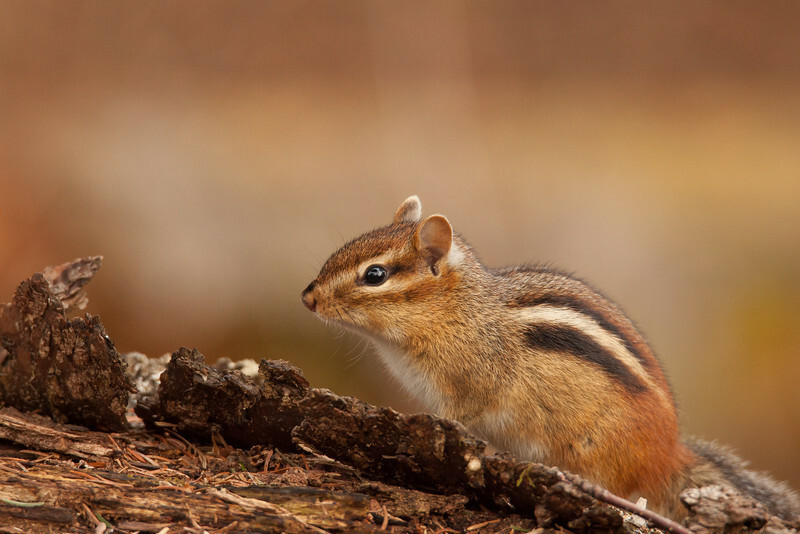 I couldn't resist sharing this image of this cute little chipmunk that was scrounging around while I was photographing a drumming ruffed grouse. 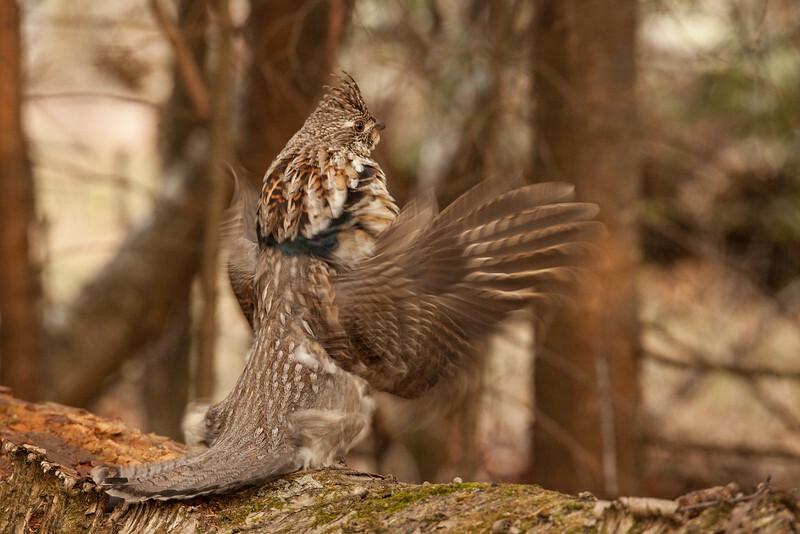 It was actually an interesting interaction between the grouse and the chipmunk. The grouse was sitting on his drumming log and every minute or so doing his drumming routine in an attempt to attract a mate. In between drumming sequences I heard some leaves rustling and so did the grouse. He became very alert on his log, scanning the surrounding forest for the source of the sound. I was actually very intrigued as well, thinking that perhaps a female grouse was approaching. We were both disappointed, I think, when this little chipmunk popped up over the side of another log. 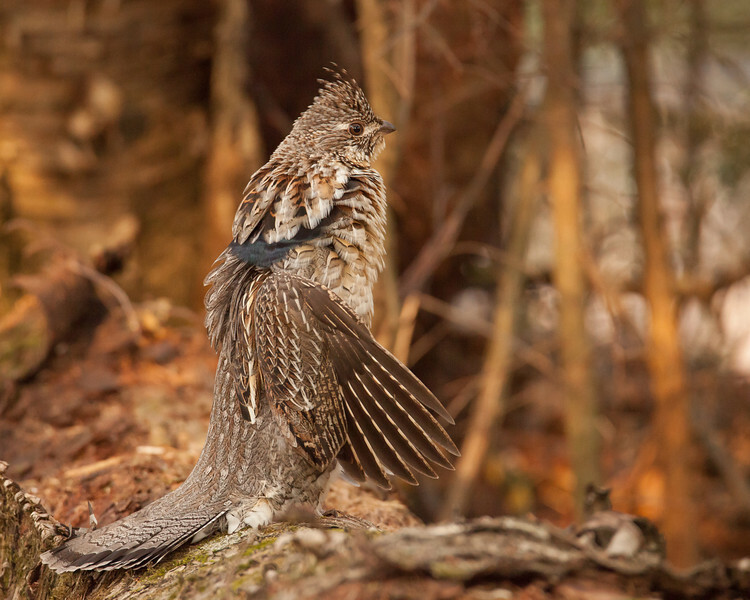 The grouse saw the chipmunk and immediately turned away as if to say "I can't believe I was fooled by that!" The chipmunk went about his business and so did the grouse, resuming his drumming after another minute or two. "Double Rainbow at High Falls"
The forecast is looking good for some sunny weather this weekend so why not head up the shore and enjoy the waterfalls in all their glory? 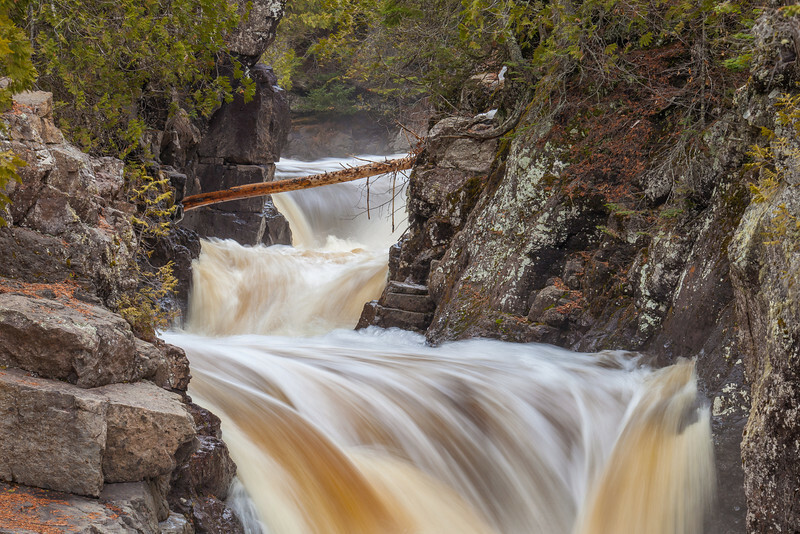 Here is a photo of High Falls on the Pigeon River taken just a couple of days ago at Grand Portage State Park. The river continues to run at a high water level and on sunny days this means that there are beautiful rainbows at the falls! Come on up and see for yourself! 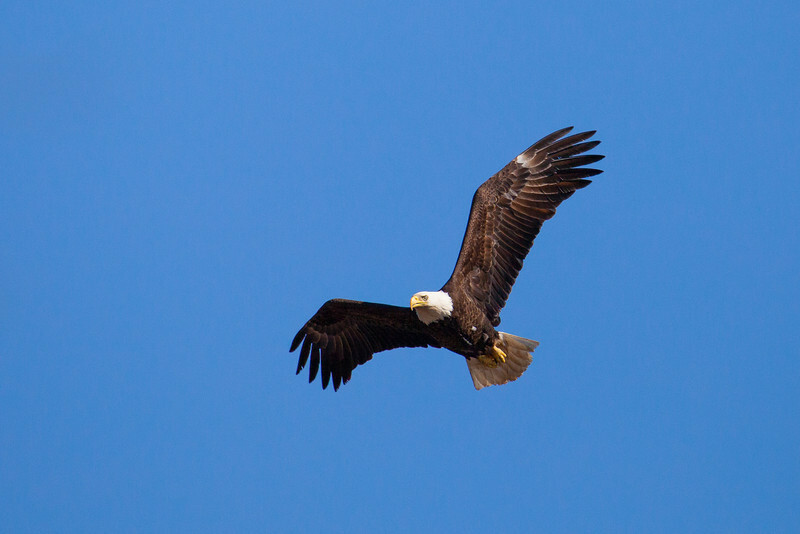 Wow, I sure had fun watching the eagles yesterday at Grand Portage State Park! While standing on the viewing platform that overlooks the Pigeon River behind the visitor center, I noticed an eagle flying low and fast over the river. At first all I could see was the eagle but soon I realized he was being chased by a raven. Then, a gull joined in the chase. I don't know what this eagle did to aggravate these other birds but they sure were persistent in chasing him off. 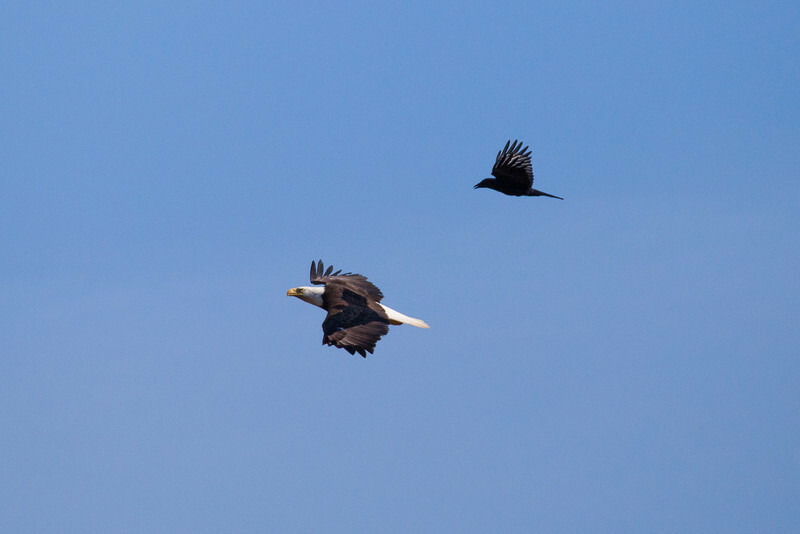 They flew several circles over the river at various altitudes then the eagle veered off away from the river and the raven and gull gave up the chase. 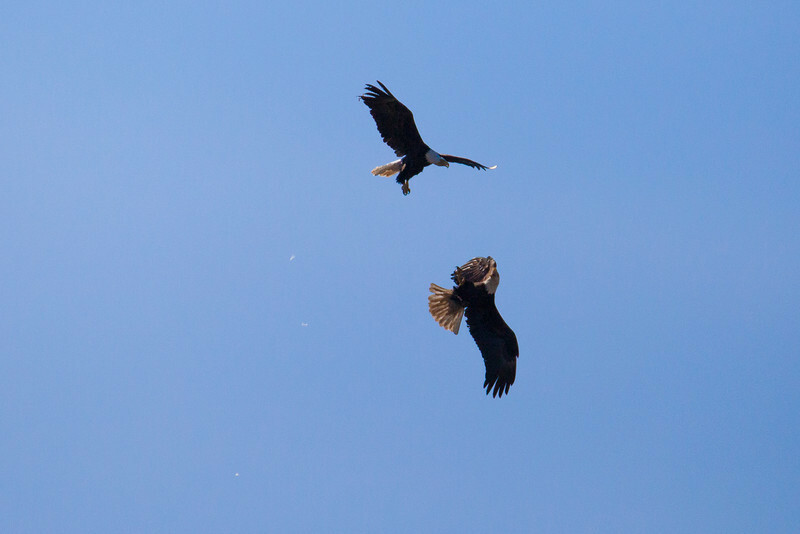 Then, I noticed that the eagle had been joined by a second eagle and they were both flying in circles directly over the visitor center. 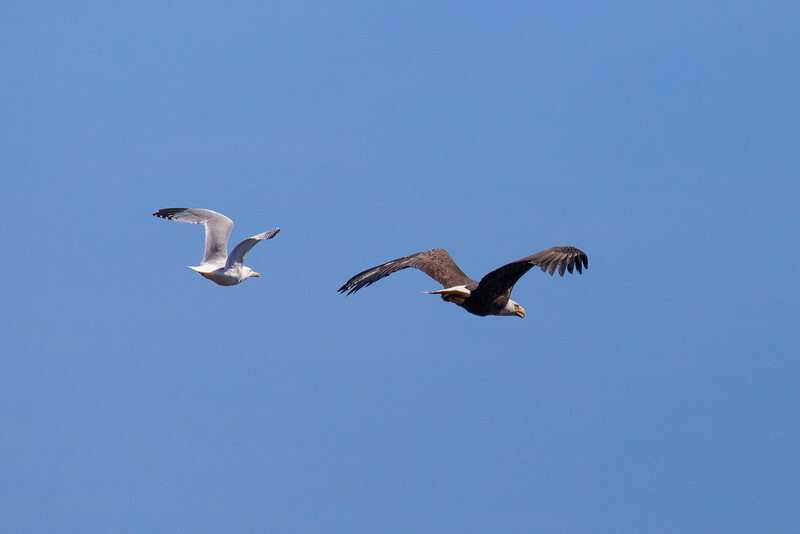 They were flying incredibly close together and soon were chasing each other around. Every now and then one of them would flip upside down and bare their talons towards the other eagle. It was a fascinating display to observe but very difficult to capture good images because the birds were moving so quickly. I got a few that I think are kind of neat and thought it would be fun to share them. "The Spirit Tree and The Milky Way"
As many of you know, I am a huge fan of the night sky and I love making images of the night sky. Whether its moonlight, northern lights, lightning storms or the milky way galaxy, I always have a blast photographing night scenes. Just the other night we had one of the best nights ever for photographing the night sky. The sky was completely clear and there wasn't a lick of wind, which meant I could hear many things that you wouldn't be able to hear on a windy night. For example, as I made this image I could hear the haunting call of Loons from across the bay. 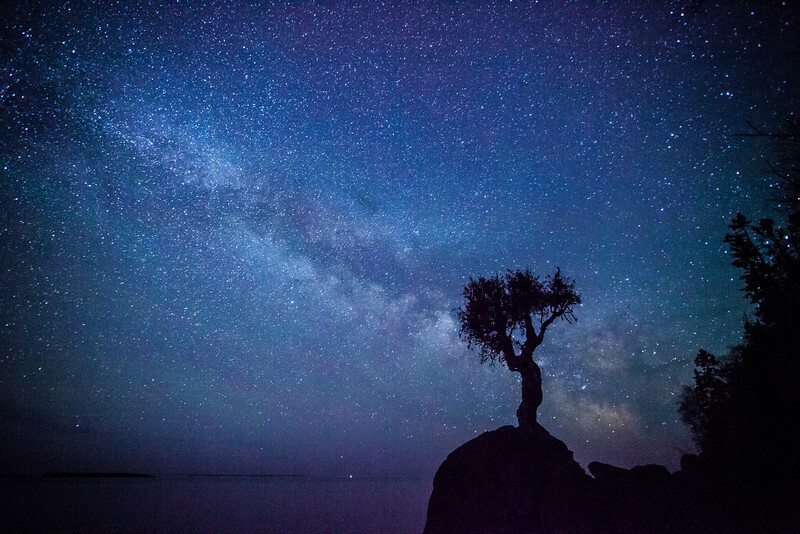 I can tell you there are few things that inspire as much fascination as sitting at the base of the Spirit Tree, staring up at the Milky Way while a pair of Loons call in the distance. 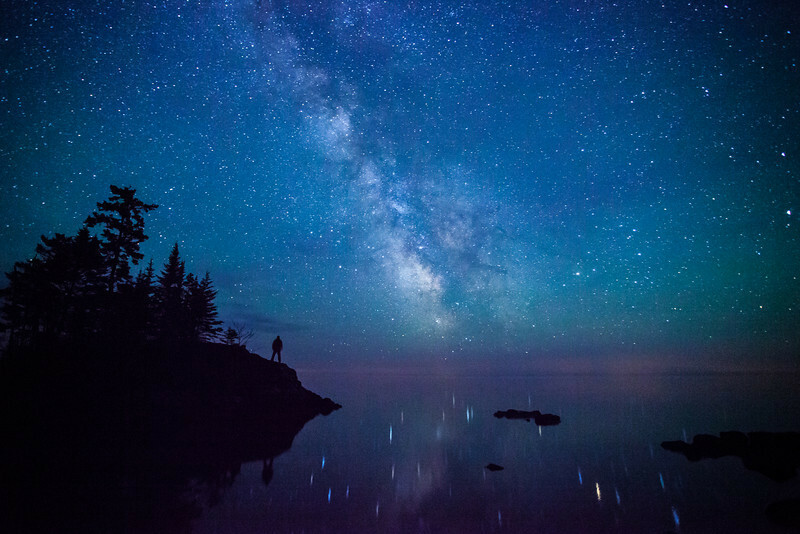 "The Milky Way over Tombolo Island - Superior Hiking Trail"
I love the night sky and I am so thankful that we have nice dark skies here in northern Minnesota! I can't imagine not being able to see the Milky Way like this when I look up at the sky at night. 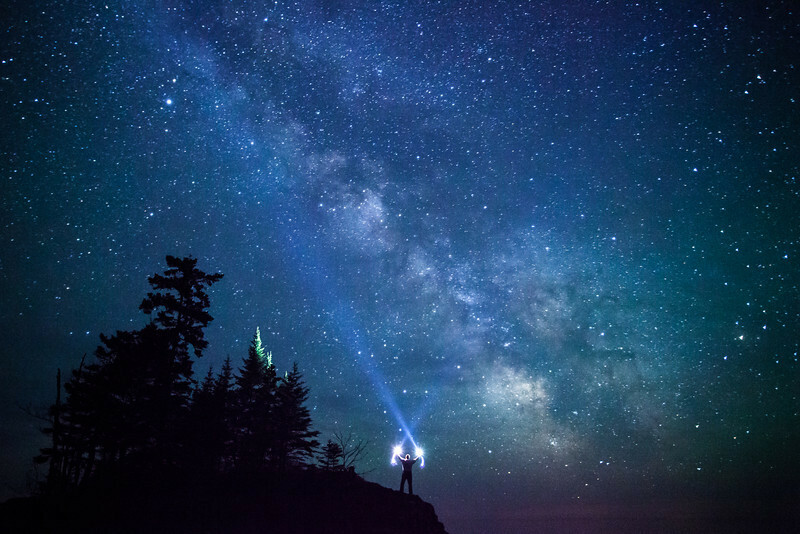 We have some of the best night sky views in the country, as this photo proves. This is looking south over Lake Superior along the lake walk section of the Superior Hiking Trail near County Road 14 just north of Grand Marais.